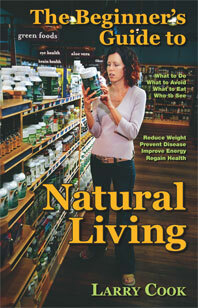 The Beginner's Guide to Natural Living: Learn how to prevent disease, lose weight, improve energy and live vibrantly. You absolutely can restore your health when your body is detoxified of poisons (detoxification), you replace chemicalized food (synthetic food) with natural food (organic food), you employ the principles of correct diet (healthy eating), you give your body maximum nutrition (supplements), your muscles are activated (exercise), your energy flow is increased (chi energy), your immune system is strengthened and your organs are encouraged to repair themselves (natural medicine), you don't poison your mouth (holistic dentistry), you buy products designed for healthy living (grocery shopping), and you "live naturally" every day. 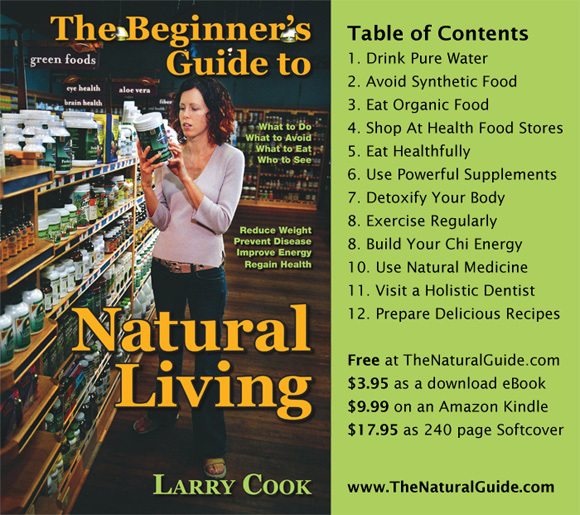 Reading The Beginner's Guide to Natural Living - and this website - will help you understand the basic principles of "natural living," a catch-all phrase used to indicate a lifestyle approach to health based on how our bodies operate, not on which drugs can alleviate symptoms of larger underlying problems. I place a strong emphasis on how to eat a healthy diet based on whole, organic food, and I provide my personal healthy recipes, because your health is absolutely determined by what you eat. By following the principles I recommend you'll be doing what millions of people are successfully doing: reversing their health conditions and living in vibrant health! Hi Larry, I’d like to thank you for your book. Since the initial reading, I’ve drastically changed what I eat (organic), the products I use, and how I exercise. Your book was the starting point for it all, & I’m much, much healthier these days. As a Naturopathic Doctor, I appreciate Larry's emphasis on the simplicity of eating a whole foods diet as the foundation for optimal health. Straight forward information for those who want to live more naturally but might be confused or have no idea where to begin! Nice job!! 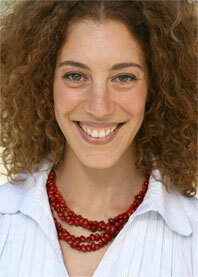 Thanks so much for writing your book...it has made the switch to organic living much easier for me. A lot of lifestyle changes....but suprisingly, none of the changes have been hard to make. We exercise, my husband lost 80 pounds, I lost 30, and we have more energy than we did 20 years ago. What a difference in four months! Hi Larry, I wanted to thank you for sending me the copy of your book and very thoughtful note. I've just finished it and am proceeding to make everyone in my general circle of friends and acquaintances read it. I haven't enjoyed insights like this since I read The Omnivore's Dilemma. You do a really nice job of balancing information from a scientific perspective, while keeping the tone colloquial enough that anyone can benefit from your work. If you're ever in Boston, I'd love to take you out for coffee, and discuss the ideas and practices further. Dear Larry: I just wanted to tell you that I read your book last week for the second time. I first came across your book accidentally due to the YouTube Videos and ordered it off Amazon. I read it about 2 years ago when suffering from Chronic Fatigue Syndrome and a host of other issues. Since then I'm in much better health now thanks very much to you. So i just wanted to say thank you so much for your efforts and thank you for changing my life. I wish you all the best for now and the future. I recommend The Beginner's Guide to Natural Living to my patients because it encapsulates all the things I would want them to know at the outset: vibrant health comes from living a more natural lifestyle, and Mr. Cook brings it all together in an easily digestible form. For my patients to have success in healing, I prescribe dietary changes such as those advocated by Mr. Cook - eating whole foods, organic foods and less processed foods. If someone is looking to get healthy or reverse a disease process, adopting the principles in this book is a great way to get started. This little gem does a great job covering the basics needed to achieve and maintain good health from a natural health perspective…It is clearly organized and packed with information that will be helpful to anyone interested in forming lifelong healthy habits. Thank you Larry. Excellent overview for starting a healthier lifestyle. Complete with websites and references. Contains a wealth of information an easy to understand book. Bravo! Dear Larry, I received your book and it was absolutely great! 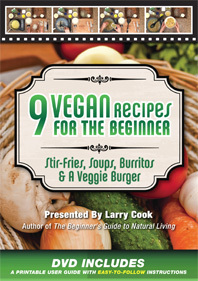 I would recommend your book to anyone whose changing to a natural living lifestyle. Since reading your book, I am dedicated to changing my habits and getting off medication. I will be trying to locate a naturopathic physician as soon as I can. Thanks for writing the book because it got me on the right track and you gave very informative information. I hope you continue sharing information to the public. Two thumbs up. I have been very interested in natural living for a while now, and slowly have been adding more and more components of it to my life. This book is a great comprehensive guide to many aspects of natural living. It gives specific examples of what to do and not to do, as well as specific product recommendations. He also has some recipes in the back of the book that I have tried and loved, and found very useful. I definitely recommend this book for anyone interested in natural living. Download healthy recipe PDF file. You can also find me - Larry D Cook - at my other website, where I discuss my coaching services; or at Stop Mandatory Vaccination, my consumer education website about why we must stop all bills that would eliminate personal and religious belief vaccination exemptions.